Still, what’s most striking now is the emphasis that director Alan J. Pakula and screenwriter William Goldman place upon informational minutiae. Goldman dispenses with the glib, facile dialogue that’s usually his stock-in-trade, sticking as closely as possible to what the actual people involved might have said, demanding that the viewer pay close attention. Pakula frequently fills the screen with Woodward and Bernstein’s handwritten notes and doodles, making it clear how many bewildering details had to be juggled in order to arrive at each new level of intrigue. 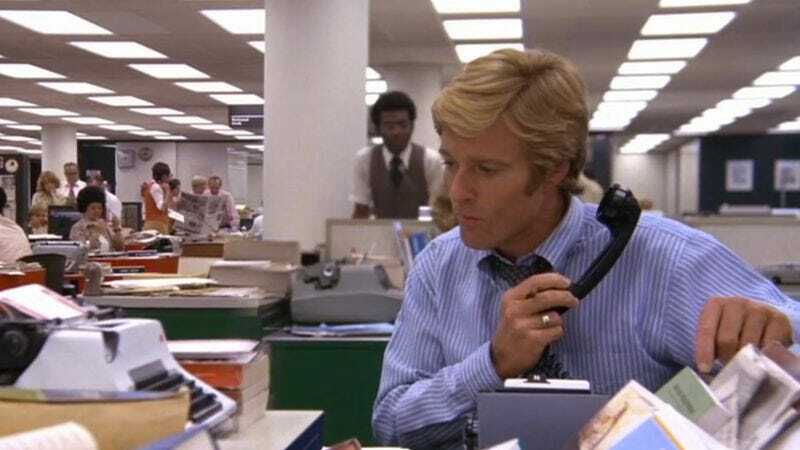 The movie’s tour de force places Woodward on the phone at his desk in the middle of The Washington Post’s newsroom, watching him attempt to figure out how a check for $25,000 earmarked to re-elect Nixon wound up in the bank account of a Watergate burglar. As written, it’s a torrent of inconclusive verbiage that takes nearly six full minutes—a small eternity of screen time—to finally arrive at a revelation. Pakula and cinematographer Gordon Willis had to find a way to communicate the essential idea visually; the solution they came up with is at once subtle and powerful. The first time I saw All The President’s Men, back in the late ’80s or early ’90s, this scene made no impression on me whatsoever. I registered the relevant plot details and moved on, oblivious. That’s probably because I watched the film on VHS, in the days before letterboxing, and the shot’s careful composition had been ruined by the need to fit a squarish TV screen. This time, what immediately struck me is that both Woodward, in the foreground, and a host of other nameless reporters gathered around a TV set in the background, are in perfect focus. The woman sitting immediately behind Woodward, however, who’s quite close to the camera compared to the TV crowd, is out of focus. This seemed so unusual that I paused the film and spent some time researching the scene, learning that Willis had employed a split diopter in order to draw the eye simultaneously to the foreground and to one specific element of the background (as distinct from, say, Gregg Toland’s use of deep focus in Citizen Kane, which creates a uniform depth of field). In Masters Of Light: Conversations With Contemporary Cinematographers, Willis explains that “the diopter is mounted on a calibrated bar so that when we were at given focal lengths, the bar was where it should be.” I can’t even picture what that would look like, but it sounds daunting—like a focus pull that’s being performed in the manner that one negotiates a boom mic. The scene begins. Woodward picks up the phone and calls a guy named Dahlberg. We can hear the TV set blaring away in the background, but the voice emanating from it doesn’t seem to be saying anything important—it’s just white noise, conveying a busy newsroom. Woodward remains our point of interest. The moment Dahlberg answers the phone and Woodward begins talking, however, a bunch of reporters run over to the TV set, indicating that whoever was speaking earlier has just unexpectedly dropped a bomb of some sort. At no point during this scene, or later in the film, do we learn anything whatsoever about the statement that causes all this hubbub. It has zero relevance to the story. All the same, it’s impossible not to be distracted by the commotion, and suddenly we’re tasked with keeping one eye on the gaggle of reporters gathered around the TV, in case that is relevant, and one eye on Woodward, who’s either unaware of this new development or just doesn’t care about it. Among other things, this serves as a reminder that the Watergate story was a tiny blip in the cultural consciousness at this stage. Everyone in the newsroom except Woodward (Bernstein, who’ll call in at the end of the scene, is doing legwork elsewhere) is concentrating on another story entirely. A pretty big one, looks like. Again, though, we have no idea. And as this scene continues, and Woodward bounces from Dahlberg to another caller and then back to Dahlberg again, it gradually becomes clear that the camera is zooming in, very slowly, crowding the reporters in the background and their subsidiary interests out of the frame. What Pakula and Willis achieve here is a slow, subtle depiction of tunnel vision. They introduce a huge distraction, employ a kind of trick photography to ensure that we can’t miss it, then proceed to negate it inch by inch, so that by the end of the shot we’re completely invested in Woodward’s investigation. To complement this strategy, Goldman writes the scene so that Dahlberg, who eventually reveals the crucial information about who diverted the check, initially hangs up on Woodward, then calls back while Woodward is grilling somebody else with the same questions. This results in a speedy little dual-line minuet that has no narrative function at all—the scene could easily have been written as a single, brief conversation with Dahlberg—but echoes our own experience of starting out focused on one thing, shifting our focus to another, then being alerted that we actually had it right the first time. It’s incredibly sophisticated filmmaking, and all the more impressive for unfolding in a single long take that never calls attention to itself as a single long take. The scene has one additional secret ingredient, easy to overlook: Redford. There’s not much to this particular scene from an acting perspective, as it merely requires Redford to be dogged and harried; the only really memorable moment is the little silent prayer he performs in response to Dahlberg saying, “I know I shouldn’t be telling you this,” which beautifully but silently conveys “Oh, please, please tell me.” Even when the shot finally lands on a screen-filling close-up of Redford’s face, the content of the conversation he’s having remains fairly mundane—he just keeps asking questions until he’s finally given a piece of information that’s useful. Thing is, though, it requires enormous self-confidence for a star of Redford’s magnitude to do so little for such a long time. This is a six-minute scene in which he never gets to show off; there’s nothing here that could have been used in a Best Actor clip (back in the days when the Oscars actually showed extended clips of nominees’ work, rather than little mini-trailers for the entire film). Redford puts his faith in the movie as a whole in this scene (and throughout), allowing himself to function as just one cog, albeit a pivotal one. There’s no way of knowing how much Pakula and/or Willis explained to him about what they were doing, or whether he understood the dynamic approach being employed. Regardless, he stayed out of their way and fulfilled the needs of the moment, which is great acting of a sort that’s too infrequently recognized or acknowledged—or even attempted, nowadays.